I decided to go meatless again this Monday. I ate bread and cheese. And potatoes. Twice. Maybe I should make that 3 reasons…. While I do love my beans and veggies, I know that if I completely omitted meat from my diet, I would fill myself up on bread and cheese daily, causing me to blow up like a stinkin’ balloon. I’m sure for some people, a diet consisting of bread and cheese is just fine. But for someone like me, who’s only ever been successful at losing weight when cutting back carbs, this is not a way for me to be in my finest form. Not to mention, bread and cheese don’t make me feel great. I started my day with potatoes. Leftovers from cooking out at my parents house on Saturday night. I don’t have a pic from today but here’s how they looked on Saturday, amidst the rest of the spread. 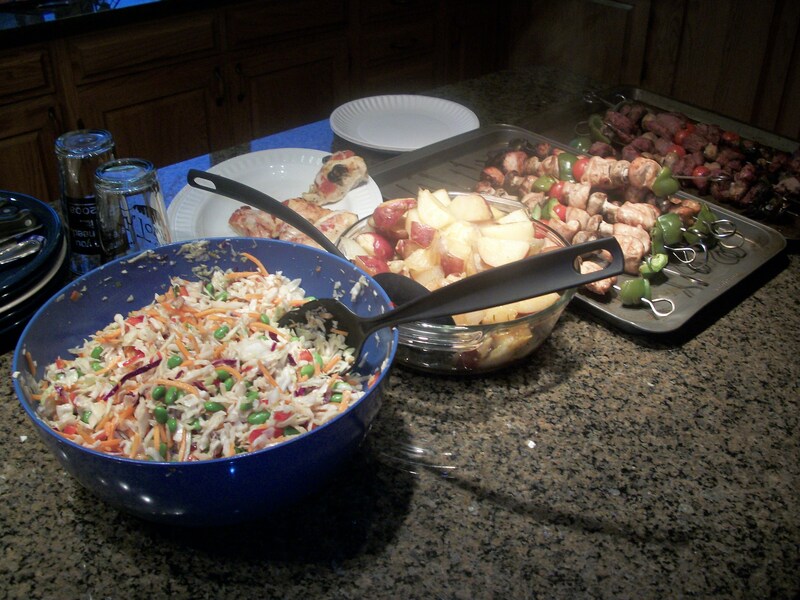 On Saturday, I had small helping and focused on the rest of the veggies and meats we grilled up. I didn’t even think twice about a second helping. But then my parents sent the leftovers home with us. I figured hubby would eat them while I was at work yesterday. He didn’t. They were the first thing I saw this morning before work. So I did. For lunch I had a tomato mozzarella & panzanella salad (read: tomatoes, spinach, fresh mozzarella & bread) with a side of mashed potatoes. Blame it on the weather (cold & rainy today, the heat wave is apparently over), or maybe it’s PMS, but all I could think about today was carbs. So I indulged. My parents also sent us home with a homemade cottage loaf. I couldn’t let that go to waste, no way. So I made grilled cheese for dinner. 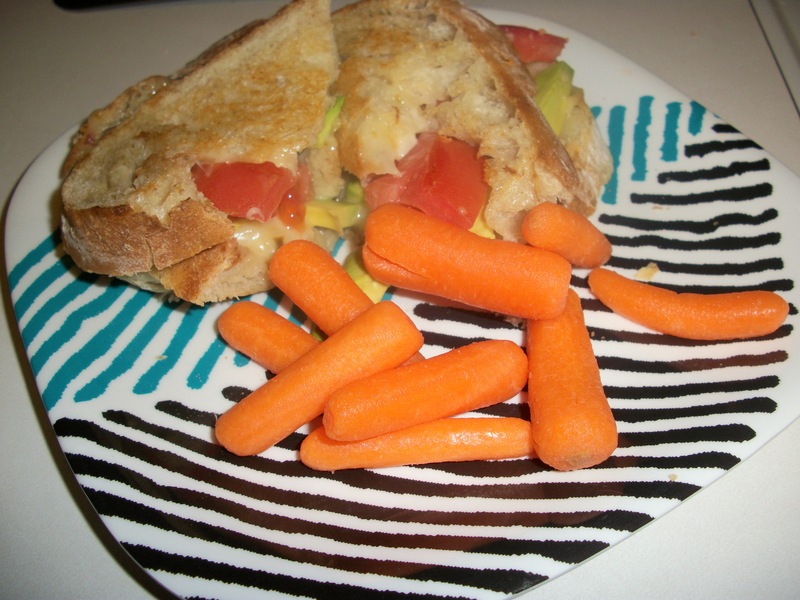 Grilled cheese with two slices of pepperjack, tomato and avocado. Plus a few carrots. Most sugary vegetable for the win! 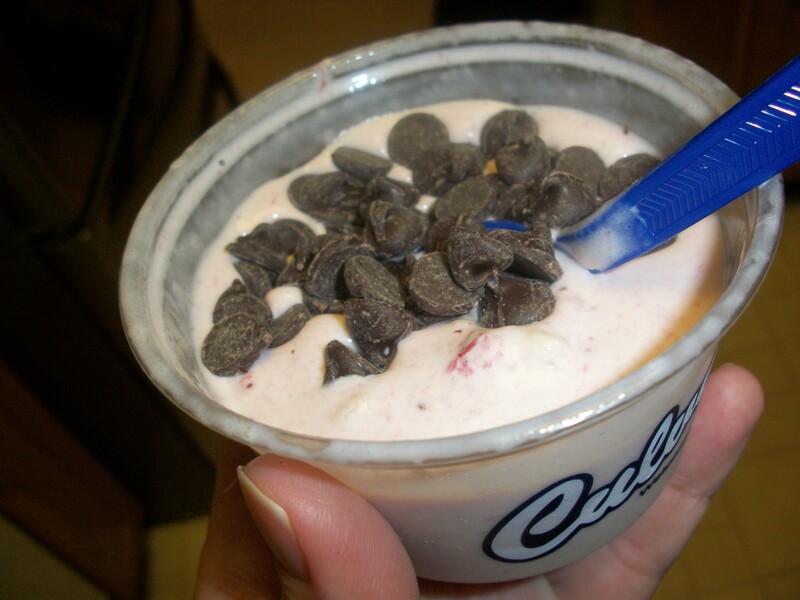 And then, because I hadn’t had enough sugar/carbs for the day, I drove to Culver’s around 9pm for a concrete mixer. Do I get bonus point because I got the mini? No, it’s still custard. Do I get bonus points because my mix-ins were strawberries & bananas? No, it’s still custard. And when I got home, I added some chocolate chips. I’m going to bed. Tomorrow shall be a bit less carby. Hopefully. Ever have those days where you just want comfort food and nothing but comfort food? Why types of foods comfort you? For me it’s all about the carbs. Bread, sugar, pasta, etc. Nothing makes me feel more cozy than a big meal (or three) of carbs.